London City Chrysler has been named a 2018 CarGurus Top Rated Dealer! This award recognizes only those dealerships that provide an exceptional level of service as determined by the ratings and reviews of CarGurus shoppers. 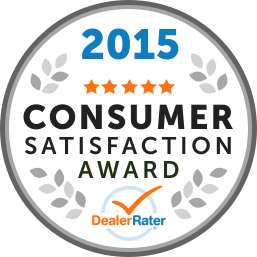 London City Chrysler is proud to receive DealerRater's Consumer Satisfaction Award for the fifth consecutive year! Read what our customers have to say about us and their experience at London City Chrysler. "Genuine Quality Service" - Sam Gustavson! at London City Chrysler! Would highly recommend Jesse as he provided excellent service and was a true gentleman to deal with! Seve helped me to find the right used minivan for my budget. Very friendly and efficient staff in every department. Great after sales service also. About 2 months after buying my dodge minivan I had a rattle at the front which turned out to be a wheel bearing which they replaced right away. Stephanie Lester in service goes above and beyond to make your time at the dealership an awesome experience, she makes you feel right at home and is very helpful. This has been the best experience by far throughout my life when purchasing vehicles! I got my dream car thanks to jay! We are beyond grateful for this opportunity. I 100% recommend this dealership and Jay to anyone looking for a car. Thanks again.